Part of our mission at the Milwaukee Youth Arts Center is to ensure under-served populations have access to high quality arts education. In accordance with that mission, all of our artistic partners offer scholarship opportunities and have active community engagement programs. No child is ever turned away from our partner programs due to an inability to pay. We strongly believe that every child should have access to arts education programs. Milwaukee Youth Symphony Orchestra- Progressions: This is an intensive string training program providing private instruction and orchestra training to third and fourth grade City of Milwaukee students with little or no experience playing a string instrument. One of the primary aims of Progressions is to increase participation in MYSO by students from minority populations that have been historically underrepresented in MYSO in other youth orchestra programs. First Stage- Next Steps: These classes are designed to help students on the autistic spectrum take their next steps as an artist and a person, allowing them the opportunity to learn social skills among their peers while participating in theatrical and musical activities. Guided by First Stage's philosophy of teaching life skills through stage skills, students experience the joy of acting, music, and movement each day with a team of teaching artists and special education professionals. 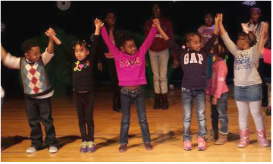 African American Children's Theatre- Be Art Smart: African American Children's Theatre teaching artists present in-school classes for third, fourth, and fifth grade classrooms in two Milwaukee Public Schools including Lloyd Barbee Montesorri and Elm Creative Arts School. Danceworks- Intergenerational Multi-Arts Program: This program builds relationships between students from Milwaukee schools and older adults from assisted living and adult day programs through dance and visual arts instruction. IMAP creates access to the arts and improves the lives of two under-served groups: urban youth and older adults. 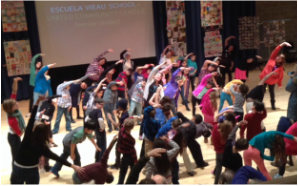 We proudly host their IMAP celebrations at the Milwaukee Youth Arts Center each year.